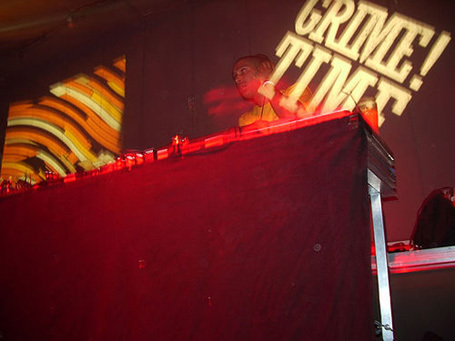 After contemplating for quite a while what I should do to keep the blog up to date and organized, I’ve decided to wrap up all grime/dubstep tings in a handy (virtual) box each week from now on. Expect reviews, event announcements, links to mixes, blog trackbacks and so on… Which of course doesn’t mean that I’ll stop writing individual post about these topics. Dangerous Drums meets Beat It! Biggest news this week is that Plasticman has finally given in to the pressure of Richie Hawtin’s lawyers and decided to chance his name to… The Plastician. Read more about this and his move to BBC Radio 1 here or read this rather old (2003), but still interesting interview that touches on the name issue as well. DJ /rupture unveils the origin of Slew Dem’s „Joyride“ beat and comes up with a very remarkable vocal version of Lady Saw on the original riddim. Check out another version of the riddim here! Cameo @ GRIMETIME – Foto: © Voco Me! Grime geht ins Theater! Im Rahmen der Reihe „Beyond Belonging – Migration“ veranstalten die GRIMETIME-Macher im „Hebbel am Ufer (HAU)“ einen Showcase mit Resident-DJ Cameo und den MC s Purple (der auf der gerade erschienenen Mix-CD „Eye Of The Tiger Vol. 1“ gefeatured wird), L-Man (N Double A) und Rugrat (Musical Mob). Lokaler Support kommt u.a. von Jahcoozi (Kitty Yo), Quio (AGF/Undergound Essentials) und G-Serve (Twen FM/Underground Essentials). Hingehen!